Awarded annually by the Dean of Graduate and Postdoctoral Affairs on the recommendation of the Director of the Norman Paterson School of International Affairs to graduate students in demonstrated financial need who are enrolled in either the Conflict Analysis and Conflict Resolution or the Intelligence and National Security Clusters. Preference will be for students who are sole-support parents. Endowed in 2009 in memory of Captain Jefferson C. Francis who was killed while serving with the Canadian Forces in Afghanistan on July 4, 2007. Jefferson Clifford Francis was born to Marion Murray and Russ Francis on Remembrance Day 1970 in Oromocto, New Brunswick. As he began his journey into the world, the bagpipes from CFB Gagetown’s 2nd Royal Canadian Regimental Pipe and Drum Band played at the Cenotaph a few hundred meters below the hospital. Significantly, it would be the same regiment that Jeff would support to his death in Afghanistan thirty-six years later. Jeff obtained a Bachelor of Arts in Mass Communication and a Master of Arts in Canadian Studies at Carleton University. Throughout his academic career, Jeff also practiced many forms of Martial Arts, and had a disciplined weight training regime. The mental and spiritual elements were as important and challenging to him as the physical. He was writing his dissertation for a PhD in Sociology at Carlton when he was drawn to the military. September 2000 marked the turning point in Jeff’s life. Searching for a more meaningful purpose and physical challenge, he enlisted in the Canadian Military at age thirty. Here he found expression for the physical as well as the intellectual aspects of his being. 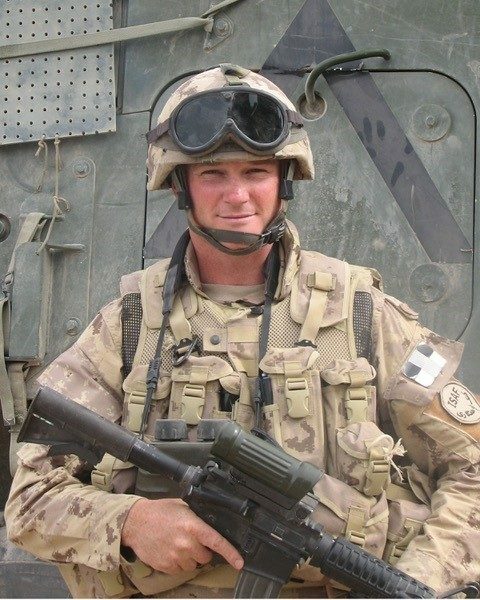 At age 36, he served in the Canadian military mission in Afghanistan. His humanitarian beliefs inspired him to provide the security needed to improve the lives of the people of Afghanistan. Captain Jefferson Clifford Francis was killed by a roadside bomb. In honour of her brother, Jeff’s sister Mica wears a tattoo of the Buddhist symbols of compassion that represent the principles by which Jeff lived—om ma ni pad me hum: generosity, diligence, patience, discipline, meditation and wisdom.